In March Macworld introduced our new iPhone Superguide, just in time for Apple to call its very existence into question with the announcement of the iPhone 3.0 software update. In the Apple world, them’s the breaks. A constant pace of innovation means that if you snooze, you lose. Which is why this summer we stocked up on black tea and Mountain Drew, and the result is today’s release of our new iPhone & iPod Touch Superguide. That’s right, we’re back four months later with an updated book that covers the new iPhone OS update and the new iPhone 3GS hardware. If you bought that edition we put out in March, don’t worry — you should be getting an e-mail offering you a free download of the new PDF edition of the book. And if you’ve been waiting until the 3.0 update came out to jump on the bandwagon and buy a convenient and attractive guide to everything iPhone and iPod touch — from basic features to accessories to great third-party apps — might I suggest that there’s never been a better time to buy our iPhone book? Here are the details. The book, 170 pages of iPhone knowledge in PDF format, normally costs $12.95, but Macworld.com readers (this means you!) can get it for $3 off, or $9.95. If you don’t want to download it, you can also order the PDF on that classic optical-disc storage medium called the CD-ROM. Enter the coupon code MWREADER6 at check-out for your discount. For complete information about how to buy the book, visit our iPhone and iPod Touch Superguide information page. And if you want to see more before you shell out for this book, I don’t blame you: We’ve created a 19-page downloadable sample that includes the book’s complete table of contents as well as sample pages. 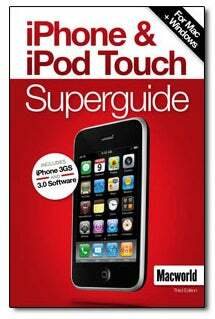 Also available in our Superguide series are the Mac Gems Superguide Mobile Mac Superguide, Mac Security Superguide, Mac Basics Superguide Leopard Edition, Mac OS X Hints, Total Leopard, the Macworld Digital Photography Superguide, and the Digital Music and Video Superguide. We think they’re really great books, and we think you will, too.